I have been struggling with my nemesis for decades. This entity creeps into a home or work space ever so subtly. It's body presents itself in stacks and piles that at first seem so innocent, even logical. Initially, the face of this dreaded, foul creature can cause a smile, outpourings of love and sometimes moments of joy. It's voice often creates a source of information or security the first time it is heard. "What?" you ask. "How can something that brings such good feelings, and seem so helpful, be thought of as your enemy? Your personal nemesis?" The creature starts as something small. An invitation or picture. A statement, sales flyer or catalog, or something one of the kids has created, accomplished or needs. The innocent item would soon find it's host. The desk, table or counter. I am sure the host varies in different environments. After some time it begins to grow. Slowly, day by day. From time to time it is rifled through, but overall it is left to grow? What would I do with the growth? 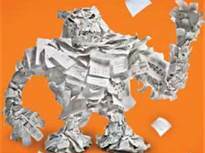 The Paper Monster. When I could no longer be blind to the pile on my desk or table, my first impulse would be just to slide it all into the trash. That would be too easy. I actually had to deal with this stuff. About once a month, I would plow through it, grudgingly, and get the bills paid. The trash was shredded or recycled. But there was often a surplus of things I needed to keep for future reference or a later action. The surplus would get dealt with about every 3 or 4 months. Papers were filed and slates were cleaned. All was well. I'd made a great accomplishment. The feeling would last for several weeks, until the next time I'd need to use my desk. The angst returned. Moments that would otherwise, I can only imagine, be serene. Carefree. Spent sipping tea on my patio and reading the next book on my reading list. That realization that I now have to encounter said monster and deal with it or not meet my responsibilities. Bit by bit the things in the pile have lost their face and pleasant voice and are connected to the rest of the body that is leaching to the silent, overwhelmed host. Over the past few years, and especially in the last months, the monster has diminished greatly, but still rears up with all its ugliness when I am ready to work at my desk each week. I have persevered. After many attempts to search for a system to do it better, and experimenting with a few ideas, my mind is still a bit unfocused. I have some good ideas in play and am still tweaking until I get this working for me. I have mapped out a path to work on different paper "systems" until the monster becomes a pet of sorts. Needing frequent, even daily, maintenance, and yet a necessary part of my life.